Forged metal parts are made from solid chunks of metal that are usually heated then pounded into shape in the forging die. The metals used are chosen in accord with required strength and durability of the part. Ultimate Tensile Strength and Yield Strength are taken into consideration when requests for quotes are received as are issues such as heat-treating, if required, and post-forging machining. Whatever forged metal product is needed, a qualified international trade manager should be able to recommend offshore manufacturers who can provide the desired product crafted using the preferred material, whether aluminum alloy, copper, magnesium, or special alloys. OEM and ODM services should be available when ordering forged metal products, including in-house mold design services. Ideally, on-site engineers will have access to sophisticated Pro-E 3D CAD development and software systems to provide design input as an added value for clients. Businesses that are importing forged metal products from China or the Pacific Rim needn’t have concerns about blindly receiving a product when you work with an experienced international trade manager who has established relationships with offshore manufacturers. They will provide you with the opportunity to communicate your needs to the exporter for your forged metal products, even if you don’t speak the same language. There are, of course, offshore manufacturers that do not offer design enhancement services or functionality suggestions that can help improve the product and reduce costs. Consult an international trade manager about your forged metal product needs before attempting to order them on your own from a Chinese manufacturer to ensure that you are aligned with a company that will aid in the design, development, casting, finishing, machining, and assembly of your order. 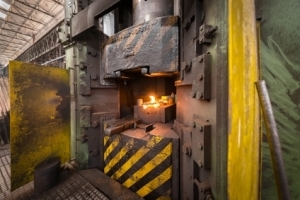 The set-up of tooling for a forged metal part, and the requisite forging press, must be considered when ordering forged metal products from China or the Pacific Rim. If the demand for the forged metal part is large, the cost of amortizing the tooling will be small. If the demand is small, then there are other options to consider that may be more economical for a small business. Semi-finished casting products like billets can lower import costs. However, it’s important to secure an offshore manufacturer’s exact definition of a billet part so that you know exactly what kind of materials you will be receiving. Intermediate castings like billets that need further processing before being completely finished will incur additional costs. The advantage, however, is that you can import in lower order quantities. The key is to know what type of metal parts you want – and to make sure that your supplier knows as well – so that there are no surprises when you open the box or receive your invoice. The tooling for a forged metal product, once an order has been placed, can take about four weeks to complete. This timeline may change depending upon the complexity of the tooling. The manufacturing portion of the sample order will take an additional one to two weeks. Shipping is likely to take one week. It’s wise to leave at least eight weeks for the actual forged metal part prototypes to arrive at your door from China. Many businesses have concerns about anti-dumping laws, which is understandable. Anti-dumping rulings can target particular exporters or specific forged metal products rather than forged metal parts as an entire product category. Legislation about importing can be confusing and concerning. It is worth the peace of mind to work with an international trade management company that understands anti-dumping tariffs and countervailing duties and aligns themselves with manufacturers that do not enlist predatory pricing and that are not subject to such duties. Discuss your prototyping needs and importing questions with Walker International. We offer a complete range of logistics services for importers of forged metal products from China, including factory-to-door local delivery.